H5C’s Spring is in the Air Contest: Congratulations Winners! This year, to say goodbye to the cold winter and hello to beautiful spring weather, we invited High-5ers’ around the world to enter H5C’s Spring is in the Air Contest! Starting on May 14th, we invited players to share with us their favorite outdoor activity for springtime. Whether it was taking walks in the park or heading down to the beach, we wanted to hear about it! I live close by a large desert area in Arizona. I love getting up just before sunrise, to be in the desert at daybreak. The quiet, and serenity is beautiful, and we have some of the most beautiful sunrises you could ever imagine, rising over the Superstition Mountains. The wildlife is very active before the heat of the day sets in, and I have been able to capture on camera, some of nature’s incredible beauty, including a herd of wild horses. The desert wildflowers are also all in bloom. Done the skydiving, base jumping, canopy stacking and general free flying thing, now it is time to get up close and personal with the ground and by ground I mean free-flying, (with the aid of a wingsuit) close to the mountains of France, Switzerland and anywhere else that allows wingsuit flying! Walling through the gardens and paths in the ancient city of Cuma, an old Greek colony which has lasted for hundreds of years. Several ancient buildings still stand, even to this day. In particular, the Grotto of Cybil and the temples located throughout Cuma. The original walkway is still visible, which are carved of old cobblestones which have survived all these years. Fishing and camping! Put me in a boat with a fishing pole and I will be happy for hours. I love the outdoors and love being able to breathe in the fresh air. Make sure to check if you are one of the 100 lucky winners today in the list below! All winners have received 200k Free High 5 Casino coins, which can be redeemed in their casino lobby! Congratulations to you all! 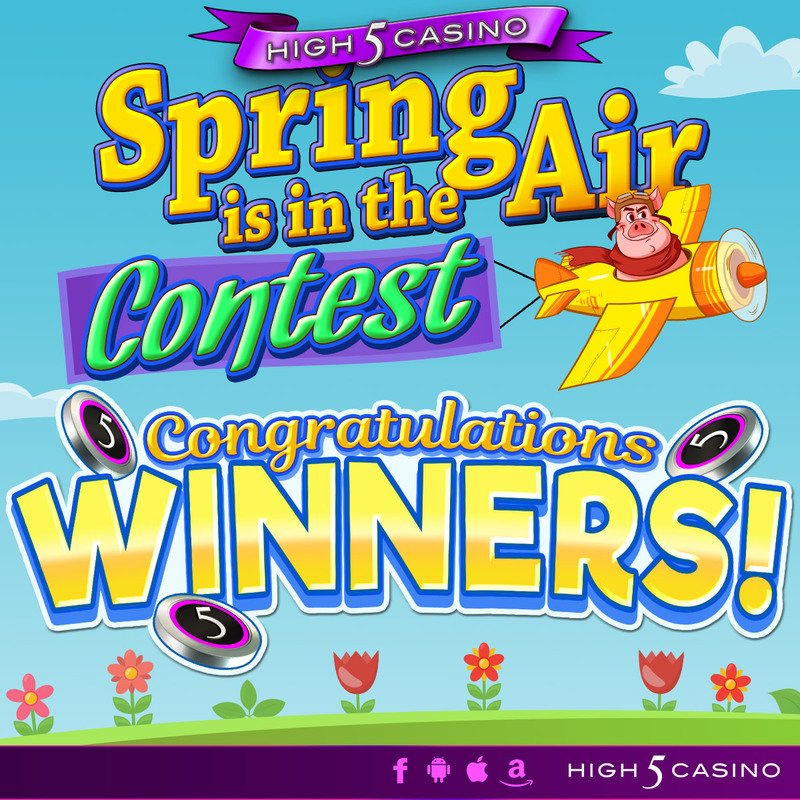 This entry was posted in H5C Contest, High 5 Casino, High 5 Games, High 5 Moments, Player Spotlight and tagged 100 Winners, 200k Free Coins, Android, App Store, Apple, contest, Facebook, free coins, Free Games, H5C, H5C Spring Contest, High 5 Casino Mobile, High 5 Games, iOS, iPad, iPhone, iPhones, Player Spotlight, slots, social gaming, Spring, Spring is in the Air by hoothigh5. Bookmark the permalink. Hello, all winners have received their coins for this promotion. If you believe you were one of the winners, Please contact the Support Team via the High 5 Help Center for assistance. It can be found by clicking on the gear-shaped symbol leading you to the ‘Settings’ menu at the top right hand corner of the casino and then choose ‘Help’. You can contact our Support Team for assistance there by simply clicking on the ‘Submit A Request’ button at the top right hand corner of High 5 Help Center. Fill out the form and a customer care representative will email you as soon as possible.